The Pinwheel Galaxy is a striking face-on spiral galaxy in the constellation Ursa Major. Charles Messier included the Pinwheel Galaxy as M101 as a late entry to his list of 110 astronomy objects. 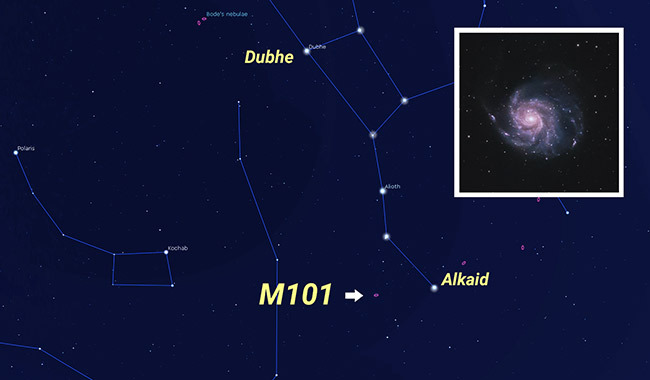 Messier 101 can be located with your telescope by star-hopping from the bright star, Alkaid, in the handle of the Big Dipper. The Hubble telescope has captured this spiral galaxy in Ursa Major in great detail. Using modest astrophotography equipment, we can photograph this incredible deep sky object from our own backyards. The image of the Pinwheel galaxy below was photographed using a DSLR camera and a 6″ Ritchey–Chrétien telescope (RCT). The Pinwheel Galaxy has an angular diameter (apparent size) of 28′.8 × 26′.9, which is quite large in terms of deep sky galaxies in our night sky. This means that a telescope with a focal length of 1370mm like the RCT used for the photo above can really pull this object in for a closer look. I have photographed M101 through a number of telescopes and cameras over the years. 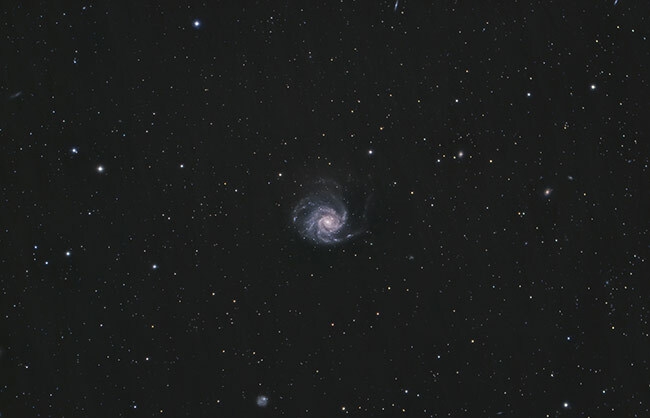 Through a wide field (80mm) refractor telescope, the Pinwheel Galaxy appears much smaller than it does in the image above. There are 3 different types of galaxies, elliptical, spiral and irregular. M101 is a grand design spiral galaxy, just like the Whirlpool Galaxy (shown at far left in the image below). As far a galaxies go, the apparent size of the Pinwheel Galaxy is one of the largest and brightest in the observable night sky. This makes it an excellent deep sky astrophotography target no matter which focal length you shoot it at. Other galaxies I’ve captured include M51, M81, and M33. The Pinwheel Galaxy can be gratifying deep sky object to observe visually through an astronomy telescope under the right conditions. It is said that a broadband light pollution filter can enhance your view of this galaxy from the city, but there is no substitute for dark skies. My experiences photographing M101 should provide you with some valuable insight for anyone looking to capture this galaxy for themselves. 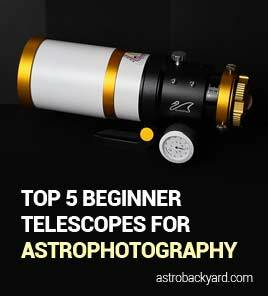 If you are just getting started in astrophotography, be sure to review my top 7 astrophotography tips for beginners. The Pinwheel Galaxy is located near the handle of the Big Dipper. Messier 101 (also NGC 5457) lies approximately 21 million light-years from Earth and is measured at an enormous 170,000 light across. This massive grand spiral design galaxy is more than double the size of our own Milky Way Galaxy. An interesting feature of this galaxy is its high population of bright H II regions. No matter what size of telescope you use, the Pinwheel Galaxy is definitely worth a look both visually and with your digital camera. The first time I photographed the Pinwheel Galaxy, it appeared very small. I used a Canon 450D DSLR camera through an 80mm Explore Scientific apochromatic refractor. 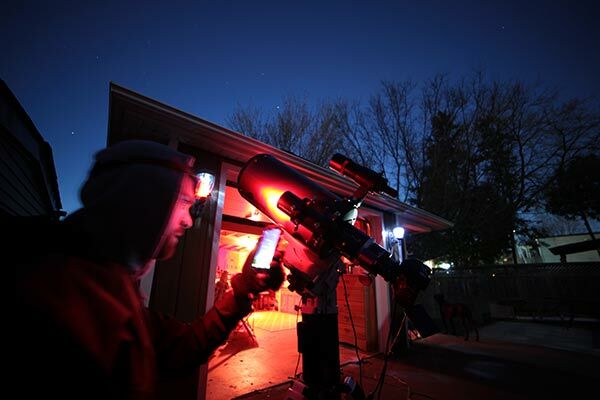 The 480mm focal length of this compact telescope produces wide swaths of sky in a single view. 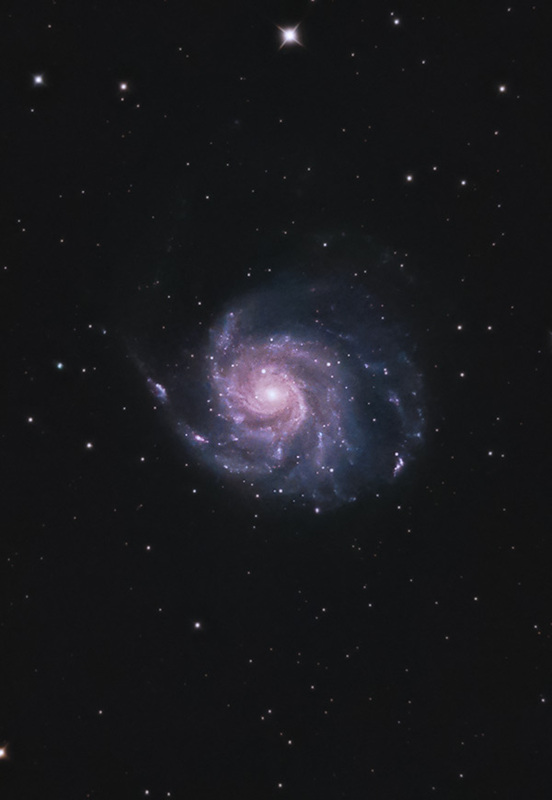 The benefit of capturing M101 at this magnification is that it produces an ultra-wide field of view that reveals several surrounding smaller galaxies. The Pinwheel Galaxy photographed through an 80mm telescope (480mm focal length). I tend to spend time on this particular deep-sky object during early spring, as this is when it’s location is the most convenient for tracking from my latitude in the northern hemisphere. By mid-April, M101 rises high into the northeast, swinging around Polaris and the north celestial pole. 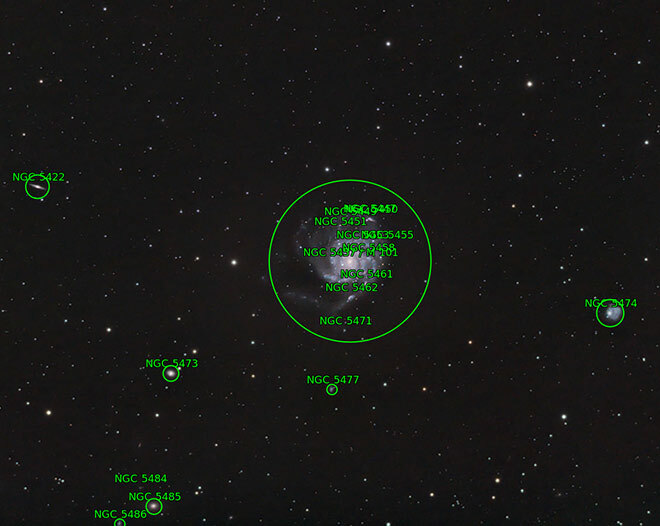 The image below shows the location I chose to set up my telescope in the backyard to capture M101. You can take a behind-the-scenes look at the strategies I used to photograph this galaxy in my YouTube video. Setting up for a night of astrophotography in my backyard. Which Focal Length to Use? In late April 2018, I began capturing more time on the Pinwheel Galaxy. This time, I had a little more focal length to play with, 1370mm to be exact. 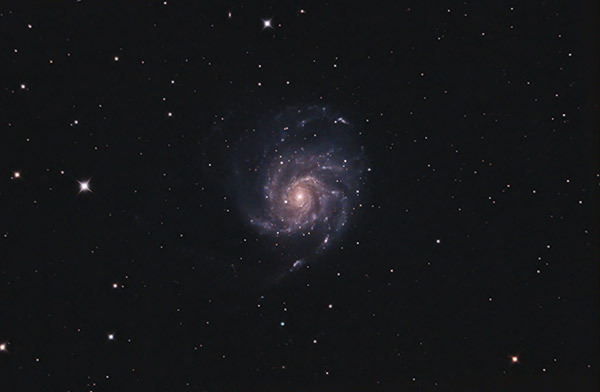 M101 was a perfect fit for the iOptron Photron RC6 telescope, with my crop sensor Canon DLSR attached. My previous attempts at this spiral galaxy produced a small image of this galaxy in the frame, as they were captured using small wide-field refractors. The RGB data was captured under an 87% illuminated moon, which certainly held the broadband color version of M101 back. My Baader Moon and Skyglow filter helped to create contrast between this galaxy and bright moonlit sky. However, much more time is required to produce a clean image with an improved signal-to-noise ratio. From the city, pouring on the overall exposure time can help make up for light polluted skies. There is hope for DSLR imagers in the city, even if you’re using an unmodified, stock camera body. In general, photographing galaxies with a stock DLSR can turn out great, often resulting in images the capture the beautiful cool blues of the object. This is because galaxies are broadband astrophotography targets, that do not require specialized filters to capture important details. A modified DSLR camera or dedicated astronomy camera will bring the H II regions of the galaxy forward, but it’s not necessary for a successful image. Despite my unjustified desire to collect full-color images of this galaxy using a one-shot-color camera, narrowband imaging with a monochrome camera is a smarter choice on nights like this. Capturing M101 in narrowband wavelengths will both help ignore the bright light of the moon, and isolate specific gases in the target to better reveal the structure. In April 2018, I leveraged a new “duo-narrowband filter” (a similar filter is the OPT Triad filter) to capture some interesting data on M101 in Ha and OIII. 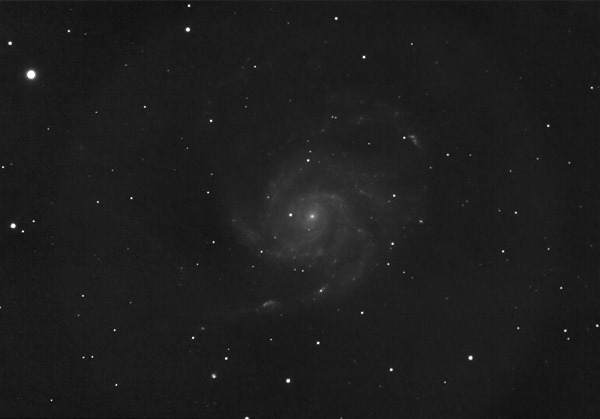 Capturing the Pinwheel Galaxy in Ha and OIII produced some sharp structures within the tendrils of the spiral arms. Usually, I reserve narrowband filters for nebulae, so I was not overly optimistic about shooting a galaxy with this filter. However, I was pleasantly surprised to see the amount of structure the Altair Hypercam 183M was able to record. I should mention that I switched telescopes for this data. The pixel scale of the Monochrome Altair Hypercam 183M was a better fit for the William Optics FLT 132 APO currently in my possession. In fact, the image scale of the iOptron RC6 with an APS-C sensor DSLR was remarkably similar to the 183M and the Fluorostar 132. This made combining the data together a lot easier! There are several hydrogen regions in M101, which really showed up in the isolated Ha light wavelengths. Needless to say, these monochrome details added a much-needed luminance boost to my color image. To merge the images together, I simply scaled the larger color image using the DSLR to the size of the 2×2 binned monochrome version. I have used this technique (capturing H-alpha details) on the Triangulum Galaxy as well, and it made a dramatic difference to my image. Shooting in broadband RGB during a full moon is far from ideal. The color images suffered from several issues including noise, lack of contrast, and washed out colors. The lack of overall exposure time made matters worse, which made processing these images the toughest challenge of all. 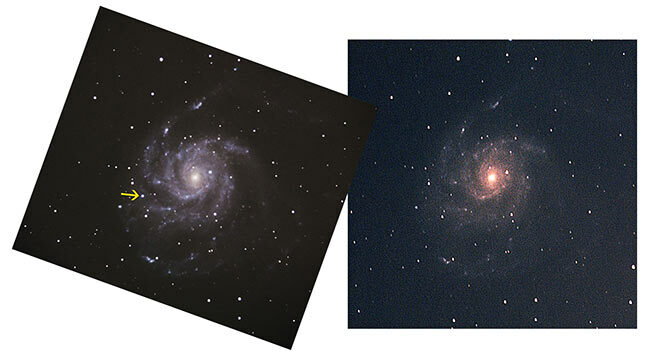 As is the case when processing all small galaxy images, a large emphasis is given to the color and balance of the background space. For my image, several iterations of gradient removal and noise reduction were applied. A layer mask was used to protect the Pinwheel Galaxy structure from losing detail and color. The star size was reduced a great detail from the original file, to boost the contrast and depth of the image. All of the software I used to process this astrophoto can be found in the resources section of this website. 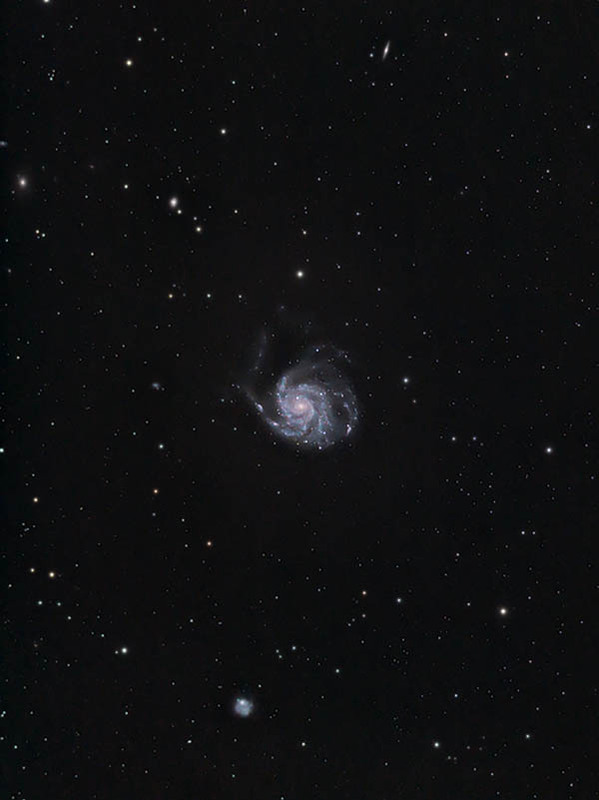 Messier 101 captured in wide field using the Celestron 8″ RASA F/2. For my final image (at the top of the page), I leveraged very little narrowband data. The 4.5 hours of broadband data captured using my Canon Rebel T3i comprises 95% of the data used for the image. I stacked a grand total of 70 x 4-minute subs at ISO 1600. The final integration included 20 darks, 15 flats, and 15 bias frames. Although I spent 2 nights capturing M101 using the Altair Hypercam 183M and the William Optics FLT 132, this data added very little value to my final color image. I’ll need to better utilize flat frames with the 183M before I can start integrating useful data into my color images using that camera. In the end, it was the data captured on May 4th, 2018 (70 x 4-minutes) that gave me the data needed for a presentable image. The moon was 82% illuminated, which is not ideal when capturing faint deep sky objects! However, my final image of M101 is a huge improvement over my previous attempts, and a great learning experience with the new RC6 telescope. In the Northern hemisphere, the months of March and April are likely the best time to capture the Pinwheel Galaxy. 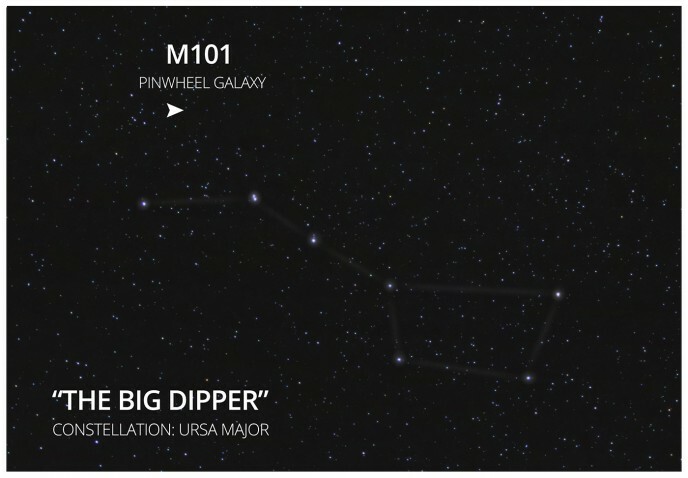 This is because the Ursa Major constellation swings up high overhead, putting M101 is a convenient location for imaging. No matter which obstructions you shoot over in the backyard, objects that climb overhead are presented to you in clear view. Shooting towards the Zenith also has the benefit of avoiding the negative effects of atmospheric turbulence associated with objects that are low on the horizon. For these reasons, my camera and telescope are often pointed towards M101 in early spring. Messier 101 has 5 prominent companion galaxies. It is said that the gravitational interaction between the Pinwheel Galaxy and its satellite galaxies may have contributed to its iconic grand spiral design. The M101 group is a loose group of galaxies in the constellation Ursa Major, and is one of many groups of galaxies in the Virgo Supercluster. Have a look at this interesting annotated image I created by uploading my image to nova.astrometry.net. You can clearly see the companion galaxies NGC 5474 and NGC 5477 in this image. An annotated image of the Pinwheel Galaxy and surrounding area. On August 24, 2011, a Type la supernovae (SN 2011fe) was discovered in the Pinwheel Galaxy. I remember hearing reports of this finding, and looking at my images of M101 to see if I could produce a “before and after” image of this galaxy. The first time I photographed M101 was on August 27th, 2011. Unfortunately, I was unable to find the supernova event in my images from the backyard. 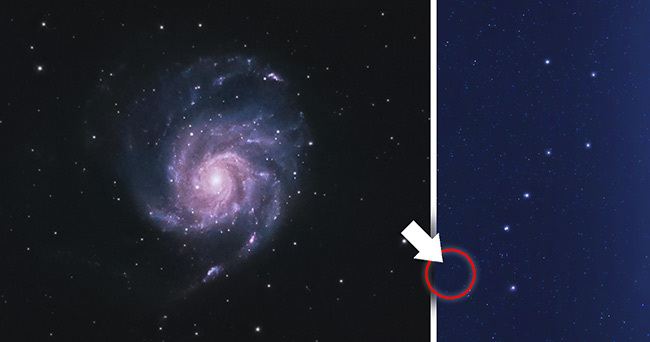 The image on the left shows to location of the supernova event as it appeared on August 25, 2011 (Wikipedia). The image on the right was captured from my backyard telescope on August 27th, 2011. Image of the supernova event that occurred in the Pinwheel Galaxy in 2011. I’ve overlayed the image to try and located the SN 2001fe in my images, but it do not see the event in my images. I believe it’s important to archive your personal astrophotography images in an organized way (by date), in case you find yourself in a similar situation where you can contribute to science in a small way.